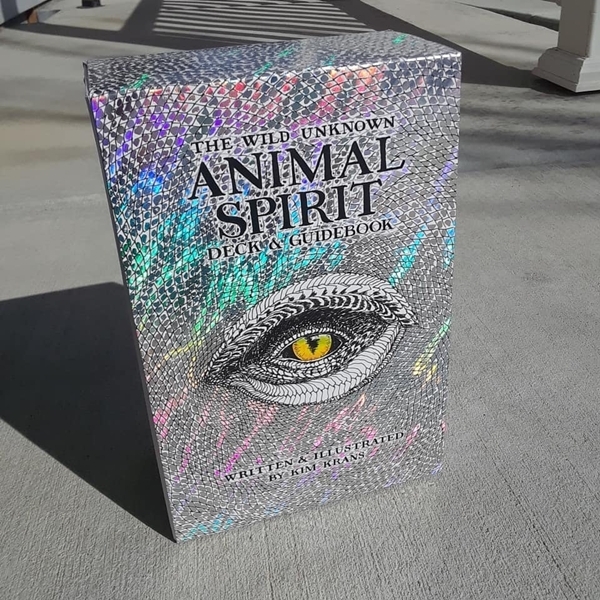 The Wild Unknown Animal Spirit Deck and Guidebook has been a popular indie deck for years, so when I heard it was picked up by HarperOne for mass publishing, I was so excited! 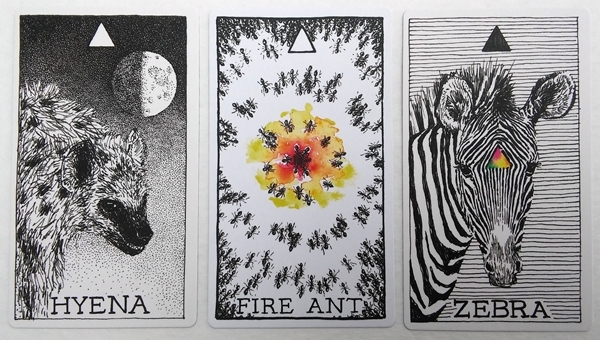 They had done such a beautiful job with The Wild Unknown Tarot that I was over the moon to finally be able to have the accompanying Animal Spirit deck, knowing the publication would be of equally high quality. The presentation of the deck/book set alone is impressive. 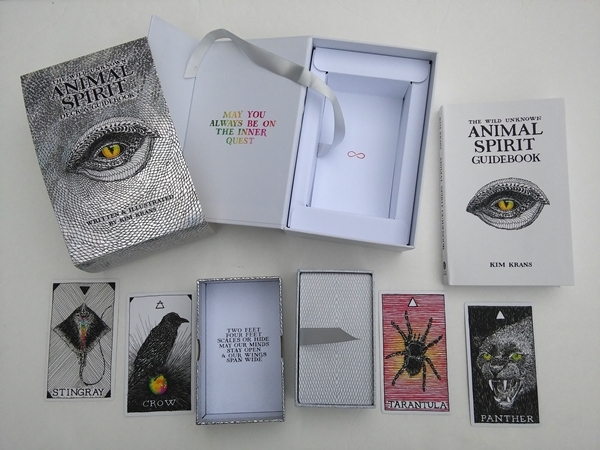 The first thing you notice about the Animal Spirit set is the holographic covers of the sleeve and inner card box. They shine like rainbows in the light! The main box has a sleeve that slides off. This box houses the book and smaller box which houses the cards. There is a ribbon in both boxes for easy extraction of the contents. The card box is thick and sturdy with a lift-off lid. The cards measure 2.75" x 4.75" and are printed on a really nice, thick yet flexible card stock with a silky smooth matte finish. They feel so good to the touch and shuffle easily and comfortably. The backs have an image that looks like dragon scales. 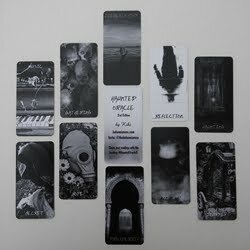 The design mirrors the backs of the TWU Tarot deck, just with different coloring. At the top of each card is the suit element symbol. And the symbols for the seven Spirit element cards are holographic! So cool!! At the bottom is the name of the animal. 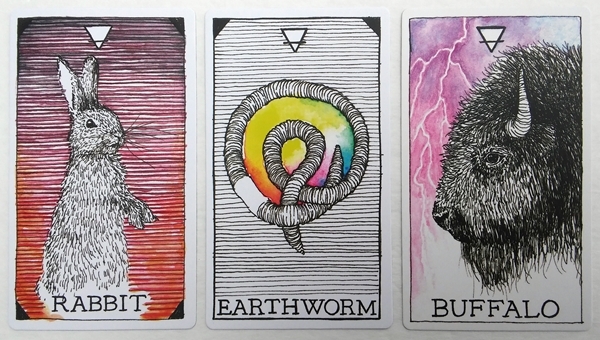 There are common animals included that you would expect to see in an animal deck (Elephant, Lion) along with some you don't often see (Earthworm, Vulture). There are no domesticated animals in the deck, they are all wild, as the title suggests. There are some repetitive animals/artwork in the deck. The Snake and Sea Serpent are very similar visually. There is a Spider and a Tarantula. There are 3 Eggs. And the Cheetah/Tiger and Elk/Deer pairings are very similar in meaning (Yin/Yang, Masculine/Feminine). 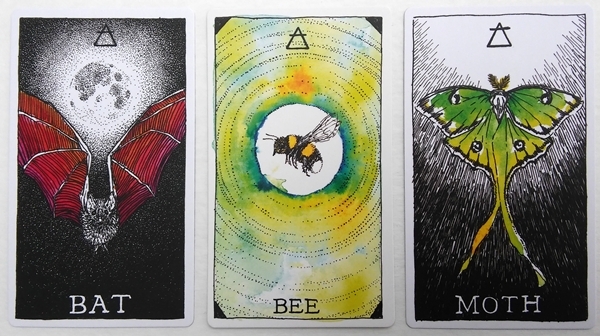 The artwork is lovely, and if you are familiar with the tarot deck by the same creator, you will recognize the lines, coloring and style immediately. The card images really stand out, not only from other decks, but also from each other in a layout, which makes for a visually attractive and clear reading. There are five elemental suits in this deck. (Fire, Air, Water, Earth, Spirit). Each of the elements are assigned 14 cards, with the exception of the Spirit suit which only has 7, each representing one of the seven main chakras. I found this to be such a wonderful added layer to the cards! The Elemental Suits feature animals that would naturally appear within those elemental environments. For example, the Air suit features flying animals, the Water suit features creatures found in water, etc. 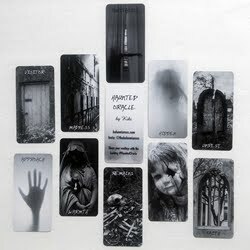 The Spirit suit features mythological creatures, and I so love that these were included in this deck! 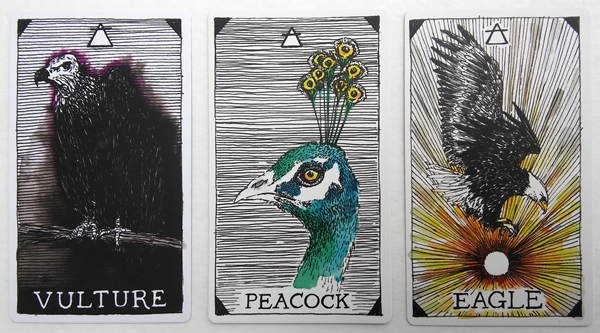 It's really hard to pick out favorites in a deck like this because they are all so beautiful, and each animal will be meaningful on different days. Visually, I love the Shark. It exudes fear and danger, with the black and white dotted imagery, and just that splash of red in the shark's mouth. I love the Unicorn card because I'm a lifelong fan of the creature. 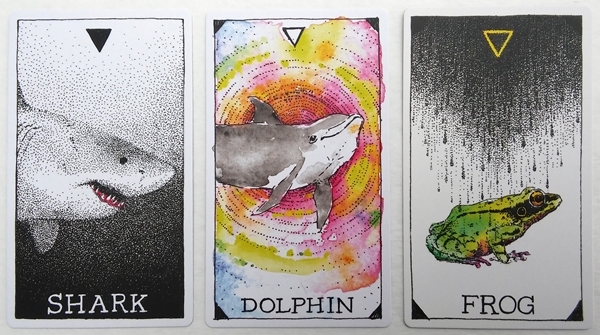 I love the wet rainy feeling of the Frog card, and the playful vibe and coloring in the Dolphin card. The use of colors, whether not at all, sparingly or splashed profusely, is brilliant in this deck. After wanting this deck for so long, my first draw with it was more than just a daily draw. It was also the first character of the group to meet me, a bigger message from the entire herd. I was welcomed to this deck by the Nightingale. It has a strong throat chakra vibe. And I had been walking around with a lump in my throat for weeks, holding a ton of feelings inside, trying to keep it all together. This bird told me to sing. And I do every time I drive. I sang that day in the car with my son and the radio. It is true, singing is therapeutic. My mood is always lifted when I listen to music so I made a note to do that more. Looking at the bigger picture, I also needed to express myself more. And do some throat chakra work. Maybe also some chanting. There was lots to work with with this first card! The next day I drew the Lizard, which signified the need to retreat from over-stimulation. And all I could note that day was, "Yes please." The day after that, I asked what animal energy in me needed to be expressed. I drew the Horse, who said to follow my momentum. It told me that I had the strength to do so. Frankly, at that point in my life, I was really tired of being strong and of the go, go, go. So there were two ways for me to interpret the message. Firstly, in the spirit of the tarot Nine of Wands, maybe this meant that I just had to push a little bit further to get the breakthrough I needed. Maybe I was almost there, but I couldn't see the finish line through the fog. Maybe the Horse was pushing me those last few steps. On the other hand, the night before I had had the idea to give up all the Yang action and just surrender everything to the divine. Release, relax and let good vibes take over. So maybe Horse was referring to this new type of momentum. Because ironically, it takes massive strength to "let go and let 'God'". So those were two opposing interpretations, and I decided to let my intuition decide which path the Horse wanted to be expressed through. The day after drawing the Horse, I drew the Zebra. The horse's non-conforming, eclectic relative, with the message to "just do you". I felt like it was a message not only for me, but for my instagram peeps, for all the hippies, artists, square pegs, visionaries and black sheep: Be unique, be different. Stay weird. Celebrate what makes you literally one of a kind. Funny, the day before, I had been watching a nature show that focused on cuttlefish who can make themselves become zebra-patterned. Zebra energy was strong those couple of days! Next up was the Beaver, which was definitely on point. The Beaver works very hard for his family. That was me, working 12-hour shifts for the next four days to put food on the table for my kids. I was channeling the Donna Summer song, "She Works Hard for the Money". My next daily draw was the Sea Serpent, representing the Second Chakra. Expressing your desires, emotions and creativity. When we don't have the freedom of this expression, the imbalances can manifest as blockages and/or overflow/overwhelm. The message I got here was to dare to be open, truthful and authentic. One day I drew the auspicious Elephant and thought, "Wow, YES, Ganesha is gonna mow down my obstacles! Woot! Finally!" ... and then I got into my new (used) car that I bought a month earlier and the check engine light comes on. And I was like "WTF Ganesha?!" The guidebook says something I had never heard before. That sometimes Ganesha will PUT obstacles in your way to redirect you to a better path. I don't know how having to pay to get my car fixed with money I didn't have was gonna help with that, but okay. There was really nothing left to do at that point but TRUST (which if I recall correctly, is one of the bits of advice in the book for this card. Trust.). Because everything always works out in the end, doesn't it? One day I pulled a card at my son's request, and he got the Otter, who is all about fun and play. We started singing a Linkin Park song together and danced for the duration. Song and dance are always a good time. Since the cards are separated into elemental suits, I was able to look back at my week to see the overall elemental theme. I had drawn 1 Air, 3 Fires, 1 Earth, 1 Water and 1 Spirit. So every element was covered with a single card, so nothing lacking, but there was overwhelming Fire energy for me that week. I like this extra layer of contemplation it adds to your readings. I found no confusing messages in the cards. Either the card of the day made perfect sense to my current situation, or it was a general message that would be wise on any given day, and therefore welcome and helpful, if not targeted. Oh, I really loved the book! And normally I don't much care for the books that come with decks, with a few exceptions of course. I know of several people online who only had the indie deck, but not the book. I couldn't understand this, other than assuming they would either look up the spirit energy of the animal as they went, or they made up their own interpretations. Me, I need the book for this one. 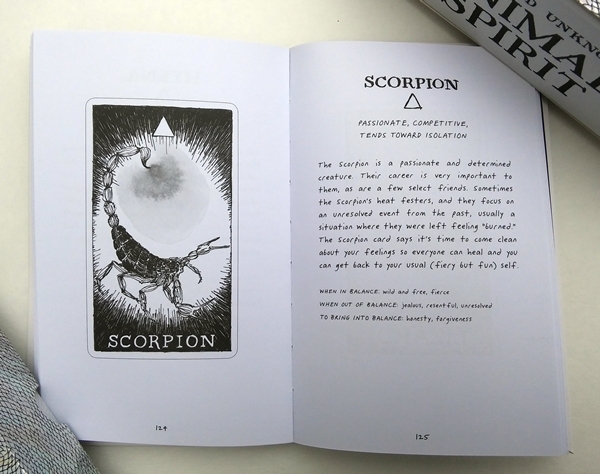 Even though the book encourages you to connect with the REAL animals the cards represent, I still really like having it as a guide. I like the handwritten font in the book. (The book wasn't handwritten word by word, but the font used was from a handwritten alphabet, I assume the creator's?). 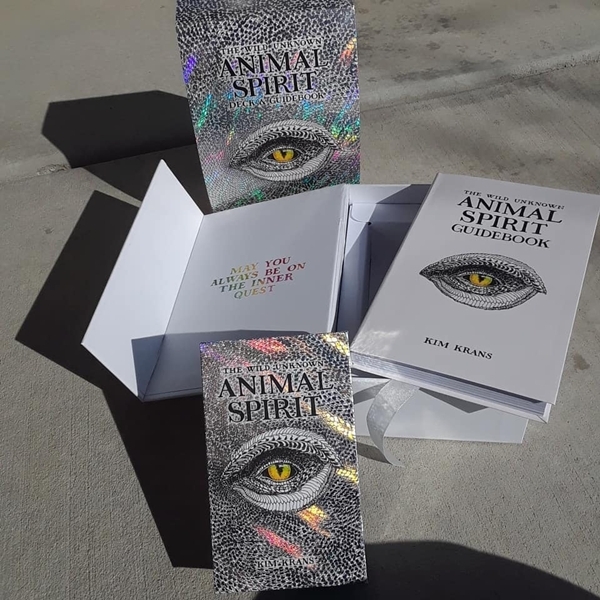 There are lots of little sections in the book, including working with animal energies, the natural order of the cards, and so much more that I won't cover them all, but I really enjoyed reading every bit of it. I loved reading in the book that all of the animals' energies were within us, and that we aren't limited to one spirit animal. So the popular question, "What's my spirit animal?" could have a different answer every day. My least favorite thing about the book, and I dislike it quite a lot, is that there is no Table of Contents or Index of the cards. The cards aren't numbered, and they aren't listed in alphabetical order in the book, so you have to search out the card you want every time. It is rather annoying and unnecessarily time consuming. 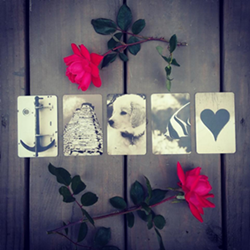 There is a page on each of the five elements, giving more insight into what it means when you draw cards from each. There is a really interesting page which encourages you to familiarize yourself with the Apex predators in the deck, as when you draw these, they are fearless powerhouse cards, having no natural predators. Also, two apex predators in the deck from different suits will fight for power. Unfortunately, the author doesn't tell us which of the animals are apex predators! So although it would definitely add another rich layer to reading with these cards, it seems like too much research for me to do on my own, and I really wish she had added that info in the book for us. I especially love the "To Bring into Balance" feature, because it gives you tangible steps to take to change something that is not going well. You aren't left scratching your head wondering what to do next. An ingenious take on the boring Past/Present/Future: Who I Was/Who I Am/Who I Will Be. I loved the reading I got with this one! 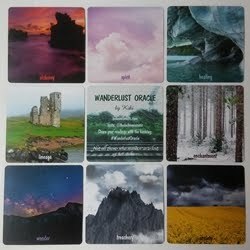 The Path, the Obstacle (a 2-card cross reading). This one was a little confusing, because it is referred to as a problem and solution, but card 1 is the path (solution?) and card 2 is the obstacle, so it seems backwards to me. 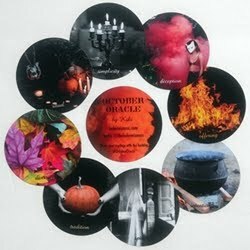 But the interesting bit with this one is that the author says the obstacle card will likely be in its "Out of Balance" state, which automatically gives you another way out, with the "To Bring Into Balance" action steps. This deck/book set is a gem. It's wildly popular for good reason. 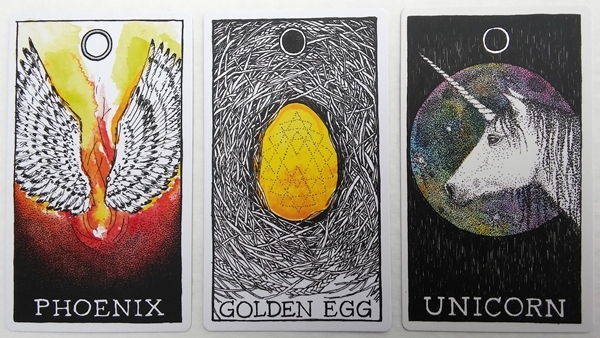 It is, of course, the perfect accompaniment to The Wild Unknown Tarot, if you like to compliment your tarot readings with oracle cards (or vice versa!). But it is absolutely a stand alone deck, needing no companion to be complete. I am so happy to finally have it as part of my collection! Deck: The Wild Unknown Animal Spirit Deck and Guidebook by Kim Krans, published by HarperOne.